A weekly dive into the NBA’s hottest topics. 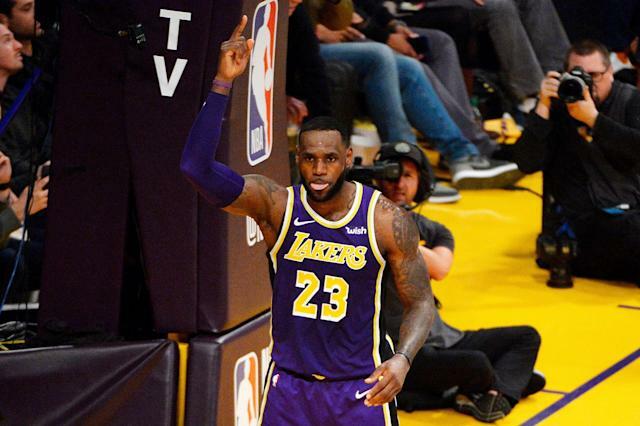 LeBron James finished the layup that inched him ahead of Michael Jordan in all-time scoring as announcer Dave Pasch exclaimed, in a loss and season that have been defined more by their trappings, “The legend of LeBron continues.” Los Angeles Lakers fans stood and applauded with smartphones in the air — our modern way of signaling the relevancy of a moment — and while a tribute video played, James privately reflected on a bench seat with a towel over his head. “I never thought I would be able to meet him. I never thought I would be able to see him,” he told reporters after the game, reflecting on a time when Jordan only existed for LeBron as an idol, a figment of cereal boxes, basketball cards, Sports Illustrated covers and posters in malls. The moment was an accumulation, not only of 16 years in the NBA, but of the faith and work and serendipity that plucked him out of abject poverty. That’s worth celebrating in any context, even with the Lakers almost guaranteed to miss the playoffs. But part of it fell flat, not just because of the malaise. Lakers fans, after all, are familiar with paying homage to a legend in the midst of basketball turmoil. They did it for 66 games during Kobe Bryant’s farewell season, even as the headaches mounted — high usage and bad shots in a lost season — just like they mounted for LeBron in Wednesday’s loss to the Nuggets: early ball dominance, lax transition defense, missed rotations, pointed fingers. The moment fell flat because unlike Kobe, LeBron’s greatest achievements were not at the Staples Center, where he was being venerated. They were in Miami and Cleveland, where he could have signed Rajon Rondo, JaVale McGee and Lance Stephenson to lifetime deals and still, on a night like this, reveled in uncompromised celebration. You understand the perspective of Lakers fans, too: They were being asked to honor a man who had yet to deliver them glory. And that’s just how it felt. James has plenty of good reasons for doing things his way. The oddity of Wednesday night, a moment that should only have been sweet, was one of its trade-offs. At practice before the Houston Rockets’ blowout of the Toronto Raptors on Tuesday to grab the West’s third seed, I asked coach Mike D’Antoni how his team maintained perspective through an 11-14 start that saw it lose multiple bodies to injuries, clank open shots and slip defensively. The repetition of solvable problems can brew crisis in locker rooms with far smaller ambitions than toppling the Warriors’ dynasty. Why were the Rockets different? Is it because he feels secure? He was speaking to his own experience, but it translates to his locker room as well. From stars James Harden and Chris Paul to role players like P.J. Tucker and Eric Gordon, the Rockets are filled with players who have accomplished — and failed — enough to know that individually, they have nothing left to gain or lose. D’Antoni has been fired from contenders, tire fires and tankers. Paul and Harden have both watched and contributed to the internal demise of contenders they played for. They all know how good teams break down. More importantly, in the face of turmoil, they know what they can and can’t control. Early in the season, the Rockets couldn’t control their fate. They did control how they reacted to it, though, never making any issue bigger than it really was. Ask anyone in the organization how they weathered it, and they’ll tell you they knew the malaise was a matter of injuries and shots not falling. They kept believing luck’s pendulum would eventually swing back in their direction. It did. Faith, even at rock bottom, is its own fuel. Star play has the power to clarify. The Detroit Pistons learned that in February when Andre Drummond played the best basketball of his career, averaging 21.2 points and 16.1 rebounds, anchoring a Pistons team that has been mired in inconsistency his whole career. Dominant flashes morphed into consistent performances, and as a result, the Pistons are 10-2 in their last 12 games, leading the NBA in net rating since the All-Star break. The gears have finally stopped grinding against each other and started working together. Reggie Jackson, finally healthy, is nailing open treys off Drummond’s gargantuan picks. And while he roams around down low, averaging 12.5 paint touches per game, Blake Griffin rules the perimeter, faking dribble handoffs with Wayne Ellington and Luke Kennard, and running the fast break. No longer are they getting in each other’s way. The lines have been drawn. The prized trade asset tasked with shouldering Detroit’s playoff hopes is finally doing less. Griffin’s frontcourt touches, 56.3 per game (which leads the NBA), are down to 47 in the last 12 games. His usage and shots have decreased, and he’s taking a career-high proportion of his shots from beyond the arc. In the modern NBA, Drummond and Griffin will never be an ideal, natural fit. But when Drummond rules the paint, they can find a way to make it work. Even when he’s not launching treys off the dribble, Trae Young is always on attack, deceiving his way closer to the rim with aggressive, jerky moves and gliding into open spots for floaters. Young drives to the rim 17.5 times per game, fourth in the NBA, and he is more likely than any of his fellow wholesale slashers to kick the ball out. Of his assists, 2.4 come off drives, second in the NBA after Russell Westbrook, simply because it rarely occurs to Young to take the one shot that had to be stamped out of the shot selection of nearly every budding star before him: contested twos. If he can’t get a three or a shot at the rim, his natural tendency is to try to find someone else who can. Young is a product of the pace-and-space era, and proof that it won’t be ending any time soon. The 3-pointer’s effect on the NBA won’t be maximized for at least another generation, when more players of Young’s sensibility enter the NBA and take over, defining the league not only with the shots they take but the ones they create for others. Maple Leaf Sports & Entertainment, the company that owns the Raptors, dedicated March 5 to its female fanbase, giving away free Raptors T-shirts to female fans who attended the game. You’d be shocked how easy it is to get something like this wrong — makeovers, bedazzled jerseys, crash courses for lady brains — and how easy it is to get it right when you actually employ the input of women, like, say, Teresa Resch, the Raptors’ vice president of basketball operations and player development, who was involved in planning the night. Here’s to a team logo in its traditional red — not pink — and white, shirts shaped for women and a night that featured no condescending pointers.